This year, as the 2009 Nissan 370Z is set to be unveiled next week at the LA Auto Show, marks nearly 40 years since the first Z car's simple origins as the 1969 Datsun 240Z. Since then we've seen the Z go all over the place, from tech-heavy with the 1991 300ZXTT and just plain heavy with the outgoing 350Z. But big was still beautiful, and each iteration of the itty-bitty Nissan, including the final one, has retained many of the simplistic design elements from the original '69. But now there's a new Z car. Will the design stack up with what's come before? Hit the jump to find out. The biggest single influence on the original Z was Yutaka Katayama, affectionately referred to as the "Father of the Z". In the pre-Z years, Katayama fell in love with the Jaguar XKE and viewed it as perfect; the epitome of the sports car. Fueled by Katayama's passion and the acquisition of the Prince Motor Company (a small company of enthusiasts who birthed the Skyline) in 1966, Nissan put the Z into production during October of 1969. Badged as the Datsun Fairlady Z in Japan, this small GT gained huge acclaim for both its design and performance. When it came time to sell the Z in the U.S. the cars were shipped wearing the Fairlady badges, but Katayama felt strongly against using the Fairlady name in America and shifted to the numbered designation that we know today (the Fairlady name is still used in Japan). Despite this small discrepancy between the two markets, the Z quickly gained cult status here in America. 1.) A coupe design for safety and comfort. 2.) A style that would set it apart from other coupes. 3.) A design that allowed part sharing for lower development costs. 4.) An innovative use of design and technology. 5.) It had to be functional and fast. The outgoing 350Z was a great attempt to rebirth these original design philosophies, but the car was portly; something the original Z was most definitely not. It appears Nissan's attempted to combat this, shortening the 370Z significantly and returning it to the 99-inch wheelbase, long regarded as the "perfect" sports car wheelbase. This cut in length translates into a lighter, more taught Z; the added horsepower doesn't hurt either. Katayama would be proud. These changes (and others) beg a comparison to the original car, so let's do that. Below we'll dissect the design of the 2009 Nissan 370Z in each sector of the car — the front, the side, the rear, the interior and of course, the badging. Other than the twin protruding "teeth" in the grille, the most noticeable change to the front end of the 370Z is a set of controversial "boomerang" headlights mimicking the design language set forth by the new 2009 Maxima. The lights now house LED turn signals as opposed to the 350Z's bumper mounted set. Gone are the geometric shapes that dominated the front of the outgoing car and we welcome the new aggressively shaped mouth, the outer edge of which hints at its brethren, Nissan GTR. Add the lights to the toothy grin of the grille and you'll see a much more aggressive look to the 370Z and add a sense of depth to the front when compared to the outgoing model. The first thing you'll notice on the side of the 370Z is the radically changed upper profile which now peaks sharply at the top of the A-pillar (more than a little reference to the GTR) and slopes quickly toward the rear of the car. The new window shape is a distinct throwback to the original 1969 240Z and helps highlight the ultra aggressive rear fenders. The fender edges have also grown in size to add to the muscular new stance. The lower rocker area has been reshaped to help lessen the 370Z's visual mass and provide interest to the previously dull body side. Also of note is the shorter wheelbase and overall length. If you look closely you'll see that Nissan took most of the visual mass out of the front and rear overhangs, but less noticeable is the decreased surface area between the trailing door shut line and the rear wheel opening. The controversial mechanically designed door handle returns, but in a more streamlined, delicate form. It features a raised touch surface for the keyless entry system; a feature similar to that found on the GT-R. 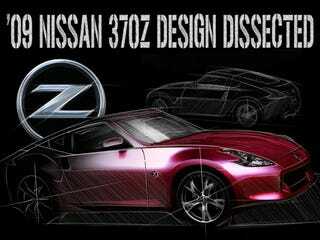 The muscular, shorter tail of the 370Z is clearly visible when directly compared with the 350Z. This is the view where the rear haunches are most noticeable; punching out from the rear fender sheet metal. The roof/hatch cut line sweeps quickly to the rear and forms the outer edge of the new "boomerang" style rear LED taillight. Gone is the rear wiper setup, providing a much cleaner look to the rear hatch glass which itself has been reshaped and now tucks in between two channels forming the top edge of the deck surface. The deck surface now sits taller with a taught trailing edge with an integrated CHMSL. The rear plate pocket sits lower in the fascia drawing your eye toward the two large tailpipes and pulls its shape from the 1984 300ZX model. Gone are the twin reverse lamps of the 350Z, replaced by a single lamp situated low on the fascia, between the tailpipes. The new interior looks to be a vast improvement over the 350Z and follows in line with current Nissan/Infiniti interior design language as well as paying homage to the original 240Z. The 3 spoke steering wheel is taken from the new ‘09 Maxima as are the navigation and HVAC controls. The main adjustable gauge cluster retains its 3 pods with the tachometer taking center stage, the speedometer sitting to the right and to the left is a new driver information display containing all the secondary readouts. The instrument panel beltline remains low and wraps into the doors and the console sweeps into the center stack; design features from the original 240Z. The triple gauge pod returns at the top of the center stack and houses the oil and volt gauges as well as a clock, now located in the furthest binnacle. Continuing the tradition of current sporting Nissans is a push button start for the keyless entry system. Nissan even included a cup holder for your Big Gulp. The door skins feature a new cut and sew leather pad (also seen on the console), a huge improvement in comfort, though the passenger loses the door pull from the 350Z. The large cross support bar of the 350Z is gone, replaced by a smaller, stiffer bar that does not impede on rear storage space. The design of the 2009 370Z badge resembles the outgoing model's, but like the exterior of the car, the Z is now more crisp, more muscular and more purposeful; the perfect expression of this new model. It can be found on the front nose, the front fenders aft of the front wheels and prominently displayed on the airbag cover of the new steering wheel. The 2009 Nissan 370Z arrives with the long hood, short rear deck proportion of the original 240Z and does so in a fresh and handsome new way. Although we'll have to see it in person to know for sure, so far this appears much less an evolution of the 350Z and more a homage to the original Z car design philosophies, something we wholeheartedly welcome.